Fall Scenery Roadtrip - We sat out this autumn to see some fall colors and we hit the jackpot. Around every corner there was another stunning site of colorful fall scenery to dazzle our senses on our drive. This area of the country actually has an autumn season something we don't see much of in the Texas hill country. In an case there was stunning fall color around every twist and turn in the roasd. We don't see fall colors much where we are from, so this was like a kid in a candy store kind of day. We had gone through this area once before but when we came back the wind had started knocking leave off the trees so we knew this would not last long. Of course we had to stop one more time to capture another view of the fall scenery in the hills of Arkansas. 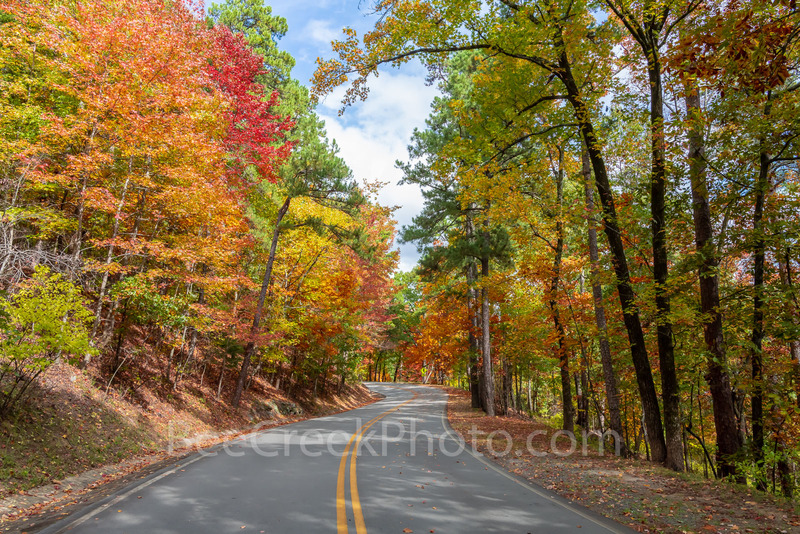 You can see the reds, yellows and oranges of the maples, black hickory, and of course the greens of the tall pine along this twisted curvey road which made this awesome scene pop with color. The most impressive were the maples as they seem to pop out from around every corner on the road. We understand that sugar maple leaves turn yellow in the shade, red in the sun, and, depending on the proportion of sun and shade, and other factors they change hourly from yellow to red to orange. My favorite were the orange version but hey I really like them all.